During one of my visits to Amber last year, I was chatting with Chef Richard Ekkebus when he brought up the idea of taking his now-signature Hokkaido sea urchin dish off the menu. Upon hearing this possibility, I apparently jokingly threatened to start an "Occupy Amber" movement if it ever happened. Of course, I promptly forgot about my joke after I left the restaurant. But Richard remembered, and when he decided that he would pass on the recipe for the dish to Corey Lee (so that it would be on the menu of In Situ, Corey's upcoming restaurant at SFMOMA) and finally take it off the Amber menu after 8 years, he spoke about this impending move to a few journalists and mentioned my "threat" as an anecdote. Without mentioning any names, of course... Heck, it even made it to the Wall Street Journal! O, the irony! Having been reminded of my threat, and shocked that he's actually going to take it off the menu, I decided to follow through with my threat and "occupy Amber". But I did ask for Richard's permission first, and he was more than willing to let me show him what I've got. Having eaten quite a lot lately, I decided I wanted a light lunch... and was going to order only 2 dishes. However I encouraged my friend to order whatever he fancied, as it seems it's been a while since he was last here. Our welcome drink today was mushroom tea, which came with a mushroom custard at the bottom of the cup, and what seemed to be wakame (若布) seaweed in the "tea". I just love the fragrant mushroom flavor coming out of the cup. 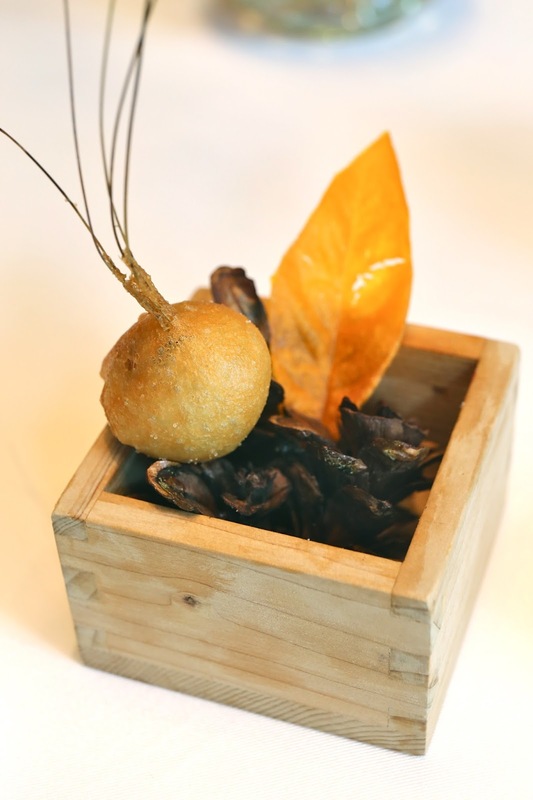 The wooden box contained two nibbles: beer batter beignet of autumn mushrooms with blackcurrant on pine sprigs, which were nice and soft inside; and an autumn leaf made of pumpkin purée which was first dried then fried, with green yuzu peel. Wild duck colvert: foie gras and Sicilian pistachio pâté en croute with spiced mango chutney - one of the two dishes I came for... the pâté en croûte. Each winter when game season rolls around, chefs with roots in traditional French cuisine would make a version of this dish - baking the mosaic of pâté inside the pastry. This year the kitchen used wild colvert duck meat along with duck foie gras, with a layer of duck consommé gelée and some Sicilian pistachio. It was suggested that we take it with the mango chutney, and I think they paired pretty well. Very, very happy. I was surprised when cutlery was laid out before me as I wasn't meant to have anything coming at this point of the meal. It turns out that Richard decided to send us an extra course. Delicatesse potatoes: slightly smoked and served as a salad with green olives, salicornia, sour cream and warm dauphine potatoes on the side - these potatoes were very nice... at least to someone who doesn't eat a lot of potatoes. I loved the sour cream, the salicornia and the green olives. Normandy scallops: confit in clarified butter on a parsley and spinach coulis, slow cooked veal shank, grenobloise condiments - a beautiful scallop sitting on a tasty pool of coulis. The sauce grenobloise on top - made with lemon, capers, and shallots - provided some acidity and tartness. We were surprised to find shredded veal shank at the bottom of the dish, buried in the coulis. Hokkaido sea urchin: in a lobster jell-O with cauliflower, caviar, and crispy seaweed waffles - finally, the other dish I had come for... and the raison d'être of Occupy Amber. This beautiful creation was just about perfect. The whole thing was soft and creamy - from the caviar to the lobster gelée, to the sea urchin underneath, and finally the cauliflower cream at the bottom. In terms of flavor there was a nice balance between the sweetness coming from the cauliflower and the sea urchin, to the umami of the lobster, and finally the stronger flavors of the caviar. The different layers just seem to meld together seamlessly and effortlessly. P.S. for those of you who don't know, the Hokkaido sea urchin dish is due to come off the menu in May 2016. After that date it will only be available at In Situ in San Francisco.